OPPO unveiled Oppo A83 in China during December with 18:9 ratio display. OPPO India has confirmed on the Twitter account that it will be launching the smartphone in India on January 20. There is no confirmation on the pricing of the OPPO A83 and it is expected to price around INR 14,000. 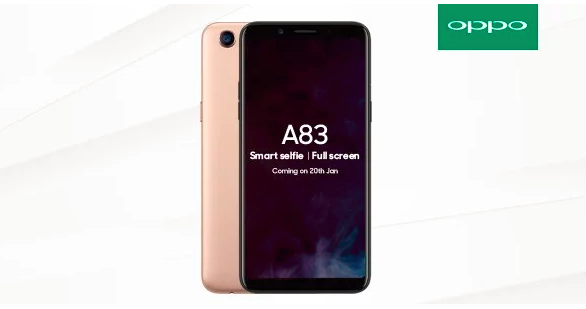 OPPO A83 that was released in China comes with 4 GB RAM, but in India it is expected to launch 3GB RAM model and battery houses 3,180mAh battery instead of 3,090mAh battery which is found in Chinese model. Phone comes with a new facial recognition technology and Oppo claims, can unlock the phone within 0.18 seconds using 128 unique feature points on the user’s face. Other features include 4G support, a 3.5mm headphone jack, a Micro-USB port, Bluetooth 4.2, and facial recognition technology. Phone does not feature any fingerprint Sensors.